ASIS- Automatic Spells, Increased Spawns, Customized AI, and more, featured as the succeeding mod to PISE. Compatible with nearly all mods! If I'm out of contact, permissions are free as long as credit is given. Out of contact means, you have tried to contact me, I have not responded, and I have not been online on both sites, be it the nexus, OR the Bethsoft forums @ Plutoman, and you cannot get a hold of DresCroffgrin (nexus), Dres Croffgrin (bethsoft), or Leviathan1753 for at least several weeks, preferably a month or more. Dres Croffgrin, Leviathan1753 for SkyProc, all the testers and support I've had. Images from users, too. 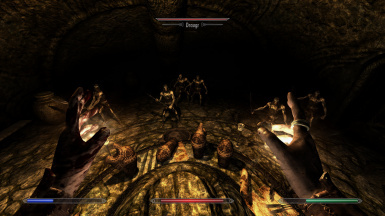 You are not the only intelligent person in Skyrim - how unrealistic is it that NPCs do not use potions? How game-breaking that, if you install a magic mod, you are the only one able to use the new spells? That a fort is held by a handful of stupid bandits, instead of a swarm? What's the point of sneaking if you could just as easily dispatch the few draugr in your way by charging into them? Seriously - you all supporting me are awesome. I had my first donation the other day. Made my week, and really helps me out (especially with college.. ugh). Thanks for all the help and support, be it helping respond to comments, be it monetarily, be it just the download itself. Automatic Variants is released! Get it here -> Automatic Variants. Leviathan1753's put a heck of a lot of work into it. Download it, love it, endorse it. Update 1.3 REQUIRES Java 7! If you get an error, please update Java! It is significantly faster than java 6, and significantly easier to use. I've also added in many code optimizations - 1.3 should run 3x faster in patching after some profiling. Get it here if you have troubles -> Java If you have a 64-bit computer, I recommend getting both 32-bit and 64-bit. If you run 32-bit, just get the 32-bit version. Put up an optional ASIS-Encounter Zones file. It is my personal plugin, and is not related or required for ASIS. When Encounter Zones are added to the program, it will be done there (with customization) - in the meantime, here's this. See this for details. If you have troubles exporting the patch (duplicate editor ID's, as an example), it is generally because you have installed Steam to the Program Files directory and ASIS does not have privileges to export the patch. This is a Windows issue. Please either move the steam installation or run the patch with administrator privileges. I cannot do any more to fix that, Java 7 requires the administrator privileges. If you cannot run the batch file, try installing the JDK, java development kit, instead of the JRE, java runtime environment. Or, replace the 'javaw' in the ASIS.bat with the directory link to the java.exe, such as "C:Program Files (x86)Javajre7binjava.exe", replaced with whatever your directory is for it. More information is in the readme! Please read it before asking questions! I want to give a big thanks to esoterism, my girlfriend (not her real name :P) for being extremely supportive in the many months I've been modding! If she makes fun of me in comments, she gets as much liberty as she wants to. I still benefit in the end. :) She's also the one who bought me Skyrim, so.. Well, yeah. Self-explanatory. Dienes here. Plutoman101 has had the dreaded real life take away from his modding time however with his blessing and Dres Croffgrin and Lifestorock's support I've taken over development and maintenance of ASIS. Big thanks to all of them for allowing me to do this and their help in getting it done. And please bear with me while the dust settles. I have some other mods so check them out maybe? I'd also like to give thanks to Dres Croffgrin, and Leviathan1753 - the former for joining the ASIS project and helping out so much, and the latter for developing SkyProc and putting up with me as I bugged him about numerous java questions, one after another. And both for being great friends. A full blown SkyProc patch means this is fully compatible with (almost) all other mods! This is my PISE successor, and plans are extensive but are unreleased for now. For more information, check this thread BethSoft Thread here. If that topic is closed, check the main mods forum for a new thread (threads are closed at 200 posts). Change logs and release notes are all listed there, and not here. Fully customizable spawn levels, including all added mods without any compatibility issues. NPC's have spells they meet the skill requirements for - including missing vanilla spells and spells from other mods. Customizable AI, with smarter enemies. NPC's now have potions, in fully customizable rarity levels. NPC's have perks appropriate for their skill levels, including mod perks. Nearly full compatibility with other mods. 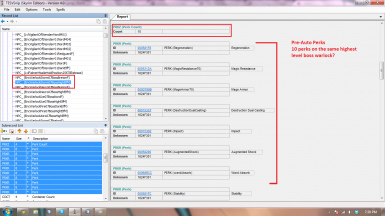 Spawn Randomization system for dynamic spawns. This is a dynamic patch, in the same manner as a bashed patch, but it generates changes instead of merging. Being a dynamic patch, it must be loaded last (yes, this means run it after the bashed patch, and load it after the bashed patch!). It benefits from a bashed patch in that the data will be merged, and it will then use that merged data to create the mod plugin. Otherwise, it goes by the load order in determining what to use if there is conflicts (it does not merge the data itself). Being a dynamic patch, it must be ran again when a mod affecting it is added. It is now safe to delete and remake ASIS.esp without harming saves. All data is remade fresh every time. The exclusions files are intended to be used for other mods. It excludes based upon PHRASES in an editor id (ie, putting down dragon on a new line will exclude every NPC with dragon in the editor ID). If you have a mod that requires it to be excluded (Warzones, DFB Encounters, companion mods) - please, ask the authors what the NPC editor ID to add to the exclusion is, or in the case of larger mods, ask what the specific keyphrase in the editor ID is for the mod's NPC's. The patcher will merge data from other mods in - preserving compatibility. 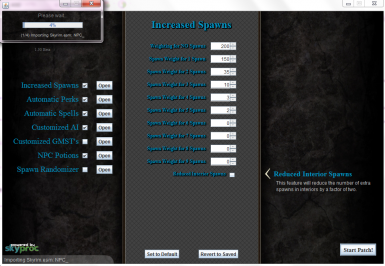 It will also add the increased spawns to new creatures, and it will add mod-spells to NPC's, both mod-added and vanilla. The plugin is simply a normal mod generated with the default settings, and will not add in exterior mods. - I'm not playing an English Skyrim and ASIS is not working properly! Answer: Change the entry in the ASIS.ini to correspond with your language. - ASIS is the successor to PISE. Can I use the two of them together? Answer: Yes. ASIS and PISE are 100% compatible. However, ASIS renders a good deal of PISE obsolete and redundant. 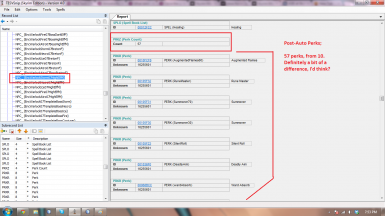 Some individual plugins of PISE, such as Encounter Zones, are still viable when used with ASIS. - Increased spawns are not working! Help! Answer: Check your plugins list. While I try to have it work with every mod, a few aren't working right. 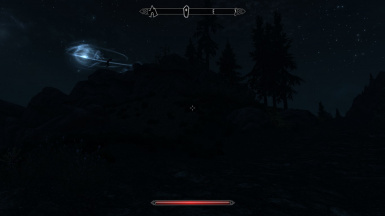 The SkyRe - Enemies.esp is a known plugin that breaks ASIS, and Wars in Skyrim is a common one too. ---- As of 1.03, the SkyRe - Enemies.esp is fixed here with an exclusion. - It's giving me errors and I use a language besides English! Answer: The alternate language support isn't quite up to par. The work-around is to change the ASIS.ini to your language, and make a copy of strings for the Skyrim.esm/Update.esm and mods you use that have errors (that have alternate language support, really), and rename the copies to have 'English' instead of the alternate language. Then run ASIS as per the normal instructions. It will import the data inside the copies that contain the alternate language text, even though they are named with the english file name. RePerkussion - While I am doing this my own way, more algorithmic and less preset, he should get some credit for motivating me to finish it. He's new to SkyProc, so excuse bugs he has - I've been doing this since like, before January. Crafting 300 - Armoury of Tamriel - An amazing weapons overhaul - materials and styles are now disassociated. That sounds pretty mechanical and uninteresting - so I'd say to check out the images to know exactly what I mean. You won't be disappointed. ACE - Comprehensive Enhancements - This is one mod you owe it to yourself to check out. It's extremely modular, easy to use, and very intelligently thought out to bring some zest into Skyrim without unbalancing it. His BYOG is also a nice add-on to make those small little tweaks easy for anyone. Apocalypse Spells - A brilliantly constructed spell pack - fairly well balanced, works well, and fits in extraordinarily well with the game. Skyrim Monster Mod - A fantastic addition to Skyrim - this guy has some amazing talents with art. If you are looking for more lore-friendly versions, those DO exist! UFO - Ultimate Follower Overhaul - A great partner to my mod, overhauling the follower system (I'm not good enough to go without a follower when using ASIS!). Very useful and easy to use! 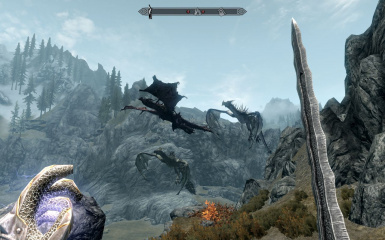 Deadly Dragons - The classic and popular dragon overhaul. The authors are great, the mod is great - what's there to lose? A Quality World Map - Most of you have seen it - couldn't play without it! Realistic Lighting with Customization - A mod I have a very large stake in - of course I'd recommend it! Sydney has taken over most of the development, but that in no way hampers it - hope you all like it! Skyrim Realistic Overhaul - The best landscapes I've ever seen. Most other textures, too, really - really impressed. CM New Companions - A great pack of companions placed around Skyrim. Definitely useful, and gives lots of options - though they may not be as fleshed out as the game's built in followers, it's still a great option. Beautiful Characters and Companions - The same as above, except all placed in a convenient spot - a nicely made lodge where you can find the followers you need. WATER - Water And Terrain Enhancement Redux - A great mod - couldn't go without. Water looks so much better with it that it's hard to describe. Other notable mentions include Sounds of Skyrim, SkyUI, Categorized Favorites, and UNP. Please follow these steps before reporting bugs and errors. If the patcher is taking a long time to create, please close it, and re-download the patcher and ini with the latest versions - please check that they are ALL in the data folder together. If you have a 64 bit operating system, make sure you download both the 32 bit and 64 bit versions of Java. This should fix issues with the java program not functioning in some cases. If a program besides java (winrar, bitzipper, anything like that) is opening the .jar - Go to Application Defaults in the Windows options. You may be able to reassign it there. If not, right click on the JAR file and choose open with. Under that menu, select Java and tick the default option. If the patcher is not running correctly, try running the ASIS.bat as an administrator. Check here -> DLL Java Help to make sure the java is working properly. Confirm that the folder structure is correct. 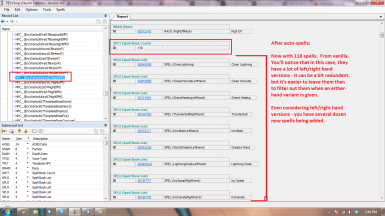 Configure the ini file to the manner you want. Run the java file (if it doesn't work, start from step #1 or check the FAQ). Confirm that the ASIS.esp is loaded after all other mods. Leviathan1753; So much assistance I can't even begin to describe it. And creating SkyProc. Basically the only reason any of this has ever happened. Dres Croffgrin; Well, he's part of the team, so I guess you all know he's involved. 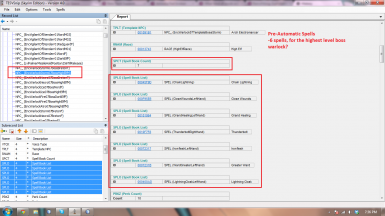 lifestorock; Great help in troubleshooting, ini additions, and more! Martigen; For discussing the mechanics of increased spawns, clearing up a few things, giving me some ideas, and being a great inspiration. Everyone who posted constructive feedback on finding and squishing bugs. If you would like to see source code, please send me a PM. ASIS has moved to Bitbucket but is still available and still under the GPLv3; Project Link. I am using the issue tracker for bugs and feature requests and will hopefully get a wiki going to help answer common questions. The project page for SkyProc is listed here; SkyProc.